The Florida Education Purchasing Consortium (FEPC) is designed to intentionally coordinate procurement among member districts. The Consortium is an administrative entity that was created as an initiative of the Florida School Boards Association and the Florida Association of District School Superintendents to help fulfill their mission to provide assistance and support to school districts. It is a vehicle by which school districts can intentionally coordinate procurement efforts in order to maximize their buying power. This leverage will improve pricing, quality, service and responsiveness from the vendors who seek our districts’ business. 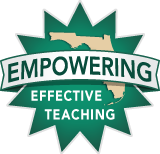 To secure additional information about the Florida Education Purchasing Consortium you may wish to visit the FEPC web page at www.floridaepc.org.